The Great Boer War (1899—1902), more properly the Great Anglo-Boer War, was one of the last romantic wars, pitting a sturdy, stubborn pioneer people fighting to establish the independence of their tiny nation against the British Empire at its peak of power and self-confidence. The Great Boer War (1899 - 1902) – more properly the Great Anglo-Boer War – was one of the last romantic wars, pitting a sturdy, stubborn pioneer people fighting to establish the independence of their tiny nation against the British Empire at its peak of power and self-confidence. It was fought in the barren vastness of the South African veldt, and it produced in almost equal measure extraordinary feats of personal heroism, unbelievable examples of folly and stupidity, and many incidents of humor and tragedy. 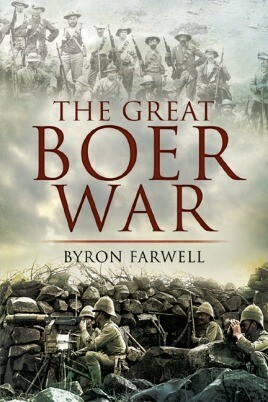 Byron Farwell traces the war’s origins, the slow mounting of the British efforts to overthrow the Afrikaners, the bungling and bickering of the British command, the remarkable series of bloody battles that almost consistently ended in victory for the Boers over the much more numerous British forces, political developments in London and Pretoria, the sieges of Ladysmith, Mafeking and Kimberley, the concentration camps into which Boer families were herded and the exhausting guerrilla warfare of the last few years when the Boer armies were finally driven from the field. Byron Farwell served as an officer in the North African and Italian campaigns in World War II and also in the Korean War He was elected a Fellow of the Royal Society of Literature in 1964.